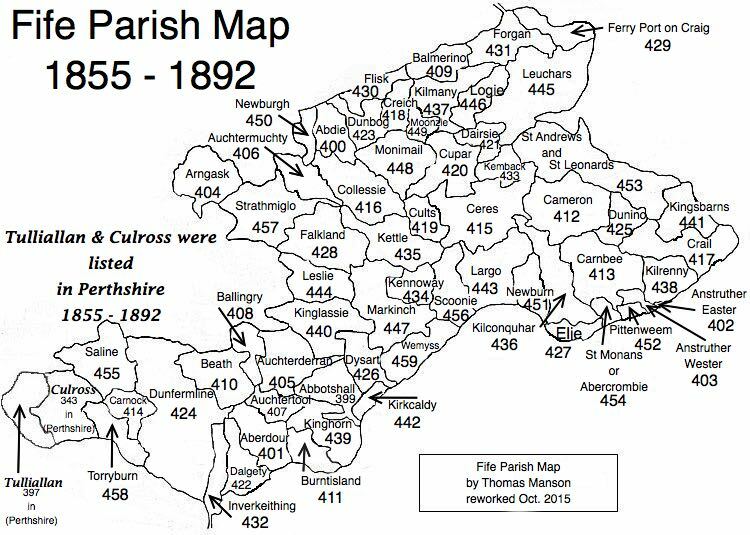 Parish of Crail – The Fife Post………..for genealogy and historical information. CRAIL, a royal burgh, sea-port, and parish, in the district of St. Andrew’s, county of Fife, 10 miles (S. E. by E.) from St. Andrew’s, and 40 (N. N. E.) from Edinburgh. This place, of which the ancient Gaelic name, Caryle, is descriptive of its situation in a corner of the county. The town is situated at the mouth of the Frith of Forth. The parish is bounded on the east and south by the German Ocean. The church, formerly collegiate for a provost, sacrist, and prebendaries, still retains some vestiges of its ancient grandeur. The name of this parish may be a compound of caer, a town, and ayle or ala, a wing or corner, which is quite descriptive of place, the town being situated in the eatern corner of the county commonly known by the name of the East Nook o’ Fife. The Isle of May has been connected with Crail since the Reformation at least, but it has also been claimed by West Anstruther. The parish is mostly agricultural. The chief crops are potatoes, turnips, beans, wheat, barley, oats, and hay. Little livestock is raised. Coal and limestone are wrought in the western part of the parish. Freestone is abundant, as is Ironstone which is frequently exported from the harbour at Crail. There is a brick and tile work on the estate of Kirkmay and fire-clay bricks and chimney cans are manufactored and exported. There are the ruins of several formerly great houses or baronial abodes in the parish, and much ancient history is connected to them. In ancient times the Danes raided the area and the remains of a dyke built by the Danes are still to be seen at the spot where the Danes are said to have killed King Constantine II. The population of the parish in 1759 was 2173, in 1791 was1710, and in 1841 was 1906 (including Kingsmuir). The population of the burgh in 1841 was 1227. In 1884 there were 52 births, 13 marriages, and 42 deaths. The town of Crail is a royal burgh of great antiquity, the charter having been granted by Robert the Bruce in 1310. Before and up to the beginning of the last century, Crail was a great station for the herring fishery, but the fishing gradually declined until the last few years when they began to appear again. However, Crail has not resumed its place as a fishing station. The harbour is mall and difficult to access, but is used for importing coal and exporting produce. Within the last few years a new trade of shell-fish has been opened with London, and salmon are beginning to be taken again. There is a post office. There are 14 persons licensed to sell spirits, and there are two medical practitioners. The present church is so old that many believe it to be the one King David I worshipped in when he lived in Crail. John Knox preached against Catholicism at Crail church in 1559 and so excited the populace that they went out and destroyed the Catholic church at Crail and in neighboring parishes. In Crail there is a meeting-house for the Associate Synod, and the Free Church is building a place of worship. In 1689 the parish minister was deposed for non-conformity and he had an Episcopal chapel erected in the west end of town where he officiated until his death in 1707. A grammar school was established in 1542 which, in 1821, was erected into a parochial school. The number attending is 93. There are three other school in the parish, two in the burgh and one at Kingsmuir. The above extract is taken from the account written in May 1845.